Dan Millman’s Way of the Peaceful Warrior has become one of the most beloved spiritual sagas of our time. Shared among friends and families and adapted into the 2006 feature film Peaceful Warrior, this two-million-copy word-of-mouth bestseller has inspired men and women of all ages in twenty languages worldwide. 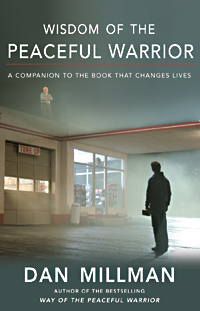 Over the years, readers asked Dan many compelling questions about Way of the Peaceful Warrior’s mysterious elements, which inspired him to write a follow-up book to address them. The result of that effort was Wisdom of the Peaceful Warrior: A Companion to the Book That Changes Lives, in which he presents 100 key passages from the bestselling classic and offers illuminating commentary. We hope you’ll enjoy this short excerpt on passing through the dark night of the soul. I’d begun to drift through the routine of school like a phantom. My world was turning inside out and upside down. I had tried to rejoin the old ways I knew, to motivate myself in my studies and training, but nothing made sense anymore. Meanwhile, professors rattled on and on about the Renaissance, the instincts of the rat, and Milton’s middle years. If we face our dark nights squarely, however, making it through such experiences can lead to greater light and a newfound sense of compassion. Important lessons emerge from the trials and testing. I learned, for one thing, that there’s a natural phase in our spiritual growth involving almost obsessive self-focus — self-remembering, self-observation, self-reflection. We have to know the self before we can transcend it. Self-focus is a necessary phase up the mountain path of personal evolution — similar to passing through a dense forest on the way to higher altitudes. But we don’t want to get lost in the shadows. Chronic self-preoccupation leads to dissatisfaction. So while this study of the self is a necessary and useful stage, it’s at best a temporary one. We humans are sometimes like children determined to sleep when someone is shaking us, crying out, “Wake up!” Indeed, we tend to glorify those who promise us riches, success, and every sort of good feeling, but resent true awakeners so much that at times we even crucify them. When I was first getting to know Socrates, my resistance and rigid investment in my identity generated a dark-night struggle with myself, a common marker on the path of awakening. But despite my resistance and fear, Socrates managed to keep me around long enough to pull off the blinders of self-image and self-deception. As I passed through that period of disillusionment and despair, I found the clarity and freedom on the far side of the tunnel that makes the ordeal more than worthwhile. This ordeal is by no means inevitable. Those willing to let go of resistance can, through faith and surrender, awaken spontaneously and gracefully, in unexpected ways. For the Buddha, sitting under a bodhi tree led to such an awakening. Insights and awakenings can happen anywhere, anytime we open our hearts without conditions. We can be reborn in an instant. May it be so! Dan Millman, a former world-champion athlete and college professor, is the author of numerous books, including Way of the Peaceful Warrior, Wisdom of the Peaceful Warrior, The Four Purposes of Life, and The Creative Compass. His writing has inspired millions of readers in more than thirty languages. Visit him online at www.danmillman.com. Excerpted from the book Wisdom of the Peaceful Warrior © 2006 by Dan Millman.